The first and last sips of a good cappuccino are always my favorite. The first is creamy and smooth and tastes slightly bitter and slightly sweet at the same time. The last has just the tiniest crunch leftover from the sugar I’ve stirred in, and it’s just a bit sweeter than the rest. Finding a good cappuccino can be a magical experience. I still always say my favorite cappuccino is at the airport in Milan (random), but my second is most definitely the cappuccino at Tartine. The line is long and the price is high, but the minute your lips hit that cappuccino you know you made the right decision. And they have scrumptious desserts too. Makes you feel like you’re in Europe. Every bite… more delicious than the last. Ever since having the Tartine cappuccino I have been craving another. I finally caved and bought a mini frother… I can make a good espresso, but I am finally venturing into the world of homemade frothy milk. Wish me luck… because I need it. 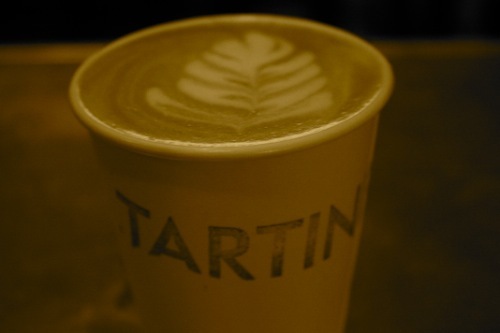 I would sell my soul to go to Tartine… and I would love to be at your house and have a homemade cappuccino! i never really drink cappucinos, but whenever i do i really enjoy them… perfect description! I love iced caramel lattes as well as a hot when it’s cold. I worked at panera and can tell you if you hold the tip of the frother so its at the top of the milk but still covered by the milk you will get the best froth that way. 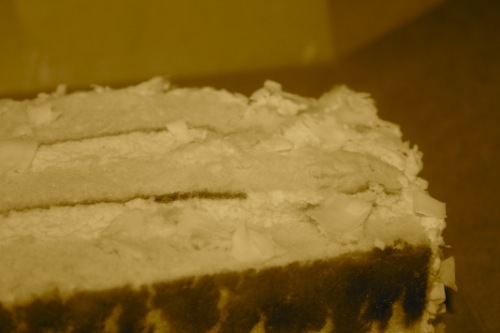 by the way that coconut cake looks to die for, I just love me some coconut! I think some of the best food/drinks known to man can be found in Italy! And theres something about being in a foreign place (whether its San Fran or Milan) that heightens your senses.